Parents of teens know how tricky it is to keep their kids physically safe while balancing their need for greater independence, but when it comes to keeping them safe online, it can be even trickier. Horror stories of social media harassment and exposure to explicit content leading to teen suicide or even murder abound. With 91 percent of U.S. teens accessing the Internet via a mobile device that allows them to be online anywhere and at all times of day, parents are desperately looking for ways to protect teens from online predators, bullies, and their own poor decisionmaking. 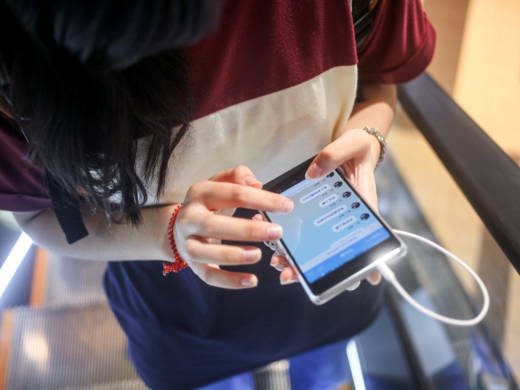 Most apps sold to promote teen safety online focus on giving parents control over the phone, rather than helping teens learn how to navigate the web safely, a study finds. Researchers looked at 74 Android mobile apps and found that 89 percent of the security features on the apps focus on parental control by blocking and monitoring teens' online activities. Only 11 percent support teens' ability to regulate their own behavior. In other words, most of the apps don't encourage parents and teens to talk about their shared social media values. And that may be a missed opportunity. "The most apparent finding from our results is that developers assume that parents are the end users of mobile online safety apps, not teens," says lead researcher Pamela Wisniewski, a former postdoctoral scholar in information sciences and technology at Penn State who is now an assistant professor in computer science at the University of Central Florida. "Teens have somehow been overlooked within the design process because these apps clearly violate their privacy and assume the only thing that can do to protect themselves from online risk is make an SOS call to a trusted adult," Wisniewski said in an email to Shots. The most surprising finding? That ReThink, the only app that gave teens a bigger role in online risk reduction, was designed by a 15-year-old girl, Wisniewski says. It's designed like those drunk texting apps that temporarily block contacts (like exes) to save us from sending ill-advised screeds at the end of a long night, but this one helps teens "rethink" before sending a potentially hurtful message. Wisniewski and her colleagues set out to reverse engineer the values in the design of existing mobile apps to try to understand what they offer. Developmental psychology says the Holy Grail of parenting teens is striking a balance between parental supervision and teen autonomy, and that teens learn coping skills when parents are actively engaged yet mindful of teens' need for independence. That general theory is supported by the American Academy of Pediatrics, which issued an online tool this past October to help families develop a media plan to create goals and rules around media use. Jenny Radesky, a developmental pediatrician at the University of Michigan's C.S. Mott Children's Hospital and lead author of the AAP's policy statement on media use for young children told Shots last fall that a printout of a plan is not going to solve every family's problems about how much screen time kids should get or whether devices should be banned from the bathroom. But it will help families lay out values in advance, rather than reacting to the latest new online challenge. Dr. Yolanda Reid Chassiakos, a clinical assistant professor of pediatrics at the David Geffen School of Medicine, UCLA, says the AAP doesn't want to paint all digital media as bad. In fact the opportunities for teens to find a supportive community and be exposed to new ideas are some of the positives. But parents must be actively involved in discussions with teens about their values. "They [parents] also must model good online behavior themselves," Chassiakos says, like participating in "media-free meals," making time for exercise, and putting the device away before bed. For their assessment of the teen mobile safety apps, the Penn State researchers developed a framework they call Teen Online Safety Strategies. TOSS weighs parents' desire to monitor, restrict and mediate teen activities with teens' need to learn self-awareness, impulse control and how to cope with risk. Of the apps they looked at, 49 percent had interactive interfaces only for parents, and 49 percent had interfaces for both parents and teens, although the teens' interfaces were "extremely limited," the study says. Forty-four percent of all the apps' features included monitoring, 43 percent included restriction and 2 percent focused on education. Meanwhile, only 4 percent of the apps' features helped teens cope with risk, 2 percent focused on teen self-monitoring, and less than 1 percent focused on teen impulse control, according to the study. It's still early days for mobile monitoring of teenagers. Currently, only 16 percent of parents use monitoring software on their teens' mobile phones, according to a 2016 Pew Research study. More often, parents check websites their teens have visited, monitor their social media profiles by "friending" them, or directly access their accounts – the online version of listening in on phone calls or sitting two rows away at the movies. Wisniewski hopes her research will lead to other studies that include teens in the design of new mobile online protections. "As adults, we need to start being more creative rather than trying to put 'governors' on teens' phones to prevent unwanted behaviors," she says. "If we want to help protect teens from online risks, we have to stop assuming that they are the perpetrators and treat them like partners." Wisniewski and her colleagues will present their paper at the Association for Computing Machinery conference on computer-supported cooperative work and social computing in Portland on Monday.